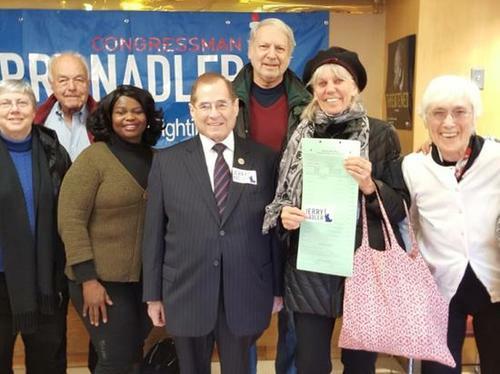 Three Parks Independent Democrats has been an active and vigorous participant in Upper West Side politics for more than 40 years. In addition to endorsing and working for candidates who demonstrate ability and progressive convictions, we attend many rallies, protests, and other political events throughout the city. In 2018, we sponsored phone banks and canvassing trips to take back congress. We meet every second Wednesday of the month. 2672 Broadway at 102nd St. If you have signed petitions, please turn them in. Petitions must be returned by March 30th. (Date has been extended.) For information about petitioning contact Bob at (212) 865-1450. Please remember that you can not witness your own signature. State Senators Brian Benjamin and Robert Jackson with the Ted Weiss Public Service Award in recognition of their championing criminal justice reform, equitable funding for the New York City schools, and support of progressive ideals. District Manager Peter Arndtsen of the Columbus Amsterdam BID with the Jesse Crawford Community Service Award for his revitalization of the Manhattan Valley business district and his decades of guidance to the youth of Manhattan Valley. Three Parks issues have included housing, health care, rezoning, gas drilling, and Indian Point. We opposed giving Amazon $3 billion in subsidies through a closed-door process, which totally bypassed New York’s New York’s Uniform Land Use Review Procedure (ULURP,) the law requiring public hearings and signoff by the Community Board, City Planning Commission, Borough President and City Council. The Amazon deal failed to take into account the true cost to the City of supplying such infrastructure as transportation or sewage for 25,000 workers. Neither did it consider the impact on housing costs. For background on what happened see our Amazon Page . Three Parks supports all efforts to strengthen and expand Rent Stabilization and to renew the rent regulations that will expire in 2019. We oppose the Mayor’s plan for a blanket upzoning of residential neighborhoods including ours. This is simply a bribe for developers to build a few units of “affordable” housing in exchange for more stories of luxury apartments, while at the same time, City government looks away as landlords drive out thousands of rent stabilized tenants. Three Parks supports a legislated ban on fracking. The fracking process pollutes vast quantities of water, a non-renewable resource. Millions of gallons of water are treated with toxic chemicals and then pumped into each gas well to force out the gas. We have worked with many allies, especially Food and Water Watch, to successfully pressure Governor Cuomo to issue a state ban on this method of extracting gas. However, a future governor could rescind the ban, which is why the legislature must act to pass it into law. Click here for more information. Three Parks opposes the expansion of charter schools in New York City and their co-location in public school buildings. We do not believe that charter schools are public schools of a different kind. In fact, they are private schools of a different kind - with public funding but no public accountability. They are a detriment to public education . Three Parks supports Medicare for All (Single Payer) health care nationally and in New York State. The New York Assembly has passed the “New York Health Act” universal health care bill (A. 5062 S.3525.) New York Health would provide universal, comprehensive health care to all New Yorkers without premiums, co-pays, deductibles, or limited provider networks. It would be paid for by a progressive income tax. According to an analysis by U. Mass/Amherst Economics Department Chair Gerald Friedman, 98% of New Yorkers would spend less for health coverage and health care under New York Health than they do today. New York would save over $70 billion by eliminating the administrative costs and profits that now go to private health insurance companies, and by negotiating pharmaceutical and medical device prices. NYC absentee ballot information and application. Board of Election NYC voter registration information and forms. Check your registration here . Read June Newsletter here Find the elected officials who represent you. Click here then type in your address. Jessica Haberstock - Design. Steve Max - Code. Technical Proofing - Hannah Leider. Invaluable Advice - Daniel Tsadok and Chuck Wall.